Learn more about Italy’s favorite treat! 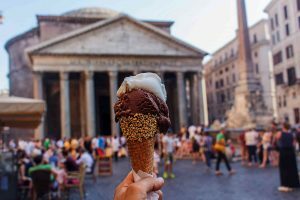 Foodies and gelato enthusiasts can easily detail how the Italian treat differs from American ice cream, but most still associate the terms interchangeably. Gelato is, in fact, the Italian word for ice cream, but their processes are entirely different. Not only does gelato contain a higher proportion of milk, but it’s also churned at a slower rate. This arduous technique incorporates less air into the mixture, allowing gelato to feel and taste denser than its American counterpart. Are you interested in learning more about gelato? Let’s explore! Gelato was born amidst The Renaissance when Cosimo Ruggieri, alchemist to the King and Queen of France, molded sorbet into an egg cream to create a sweet, creamy delicacy. The recipe was then modified by Bernardo Buontalenti, whose name has since been turned into its very own gelato flavor. Soon, gelato was served across Europe and enjoyed casually with coffee. With the help of street vendors, gelato was popularized throughout the globe, and soon the first ice cream trucks appeared in Europe and North America. An Italian immigrant, Italo Marchiony, is speculated to have originated the sugar cone so that vendors could pass out gelato in the streets with ease. Growing interest and technologies provided the industry with sophisticated tools necessary to maintain the frozen treat for sale. Advancements in technology allow for almost anyone to make gelato, but not everyone has the patience and ability to make great gelato. The demand in Italy continues to sustain their market. According to Bloomberg Markets, Italian gelato makers made 157 million gallons of Gelato in 2016, about 19% of total EU production. Germany ranked second with just 136 gallons. It’s estimated that over 19,000 gelaterias (gelato parlors) line the cities and countryside of Italy, and more are expected! This entry was posted on Wednesday, March 7th, 2018	at 10:00 am	. You can follow any responses to this entry through the RSS 2.0	feed. You can leave a response, or trackback from your own site.